Who Can File a 1040EZ? Since the IRS does not mail out tax returns automatically, you need to decide which version of the 1040 form to use. An exception is e-filing in which the software selects the appropriate form for your circumstances. Otherwise, you must choose among the 1040EZ, the 1040A and the regular 1040 for your income taxes. In 2019, the IRS is getting rid of the 1040EZ and 1040A and replacing them with a new 1040, but until then, you can still use the 1040EZ. You qualify to use this short form only if you meet all income and filing requirements and do not have any disqualifying special circumstances. 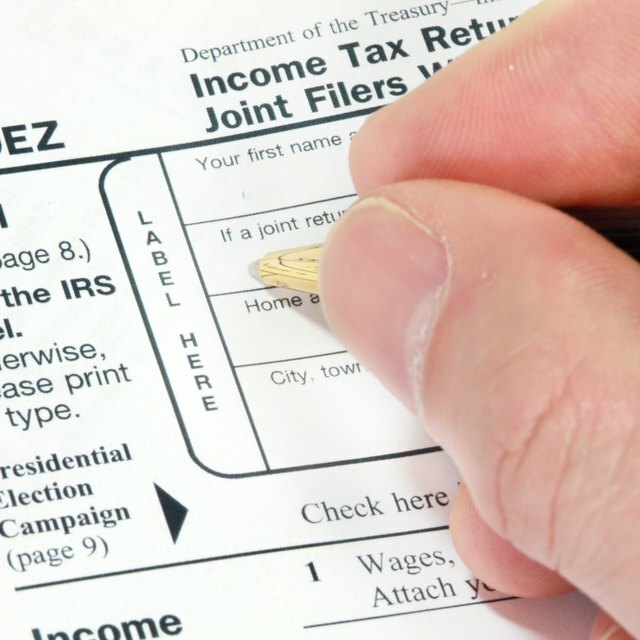 Taxpayers can use the 1040EZ if they are filing as single or married filing jointly without dependents and they meet certain income requirements. A form 1040EZ is suitable for a single person or married couple without children who can meet income requirements. To use the 1040EZ, you must file as single or married filing jointly, and you cannot claim dependents. You must have total taxable income for the year of less than $100,000, with the interest portion of income not over $1,500. Neither you nor your spouse can be blind or age 65 or over. Maximum income and other requirements are current at publication but subject to change. Other specific situations will prevent you from using the 1040EZ. Do not use 1040EZ if you have income from any source other than grants, scholarships, unemployment, salaries, tips, wages or dividends from the Alaska Permanent Fund. Claiming adjustments to income or credits other than the earned income credit and making work pay disqualify you. Examples of adjustments you cannot claim include IRA contributions and interest on a student loan. Payments for advance earned income credit disqualify you. Having filed for chapter 11 bankruptcy later than October 2005 disqualifies you. You also cannot use 1040EZ if you owe household employee taxes or use Schedule L for the standard deduction. If your spouse died during the tax year, or before the filing period, and you meet other requirements, you can file 1040EZ as a surviving spouse. Alternately, a representative of the deceased can file. If you did not remarry, you can file jointly as the surviving spouse. Not all low wage earners need to file even the 1040EZ form. As a single person, if you are not blind or age 65, you must file only if you had gross income of $10,400 or more. If you and your spouse filing jointly are not blind or age 65 or older, you must file only if your gross income came to $20,800 or more. However, if you earned less than these amounts, you must file to receive a refund of any taxes the government withheld. If your spouse died, you still must file to receive any refund. Intuit Turbotax: What Is the IRS 1040EZ Form?